Temperature of World Cities, 2011. 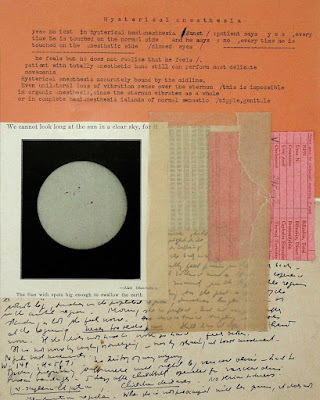 "Janet Malcolm: Last winter, I came into possession of the papers of an émigré psychiatrist who practiced in New York in the late 1940s and 1950s. The archive included a collection of manila envelopes, around six by ten inches, stuffed with folded sheets of thin paper covered with single-spaced typing: the notes the psychiatrist made after seeing patients (many of them fellow émigrés) in his office. As I studied the sheets with their inky typewriting and 60-year-old paper clips holding them together and leaving rust marks on the surface, my collagist’s imagination began to stir. I began to 'see' some version of the collages on view here. The scraps of paper I collect are largely black and white (preferably yellowing white) and have an archaic and melancholy air about them. They hark back to the 19th century and its technological and scientific vernacular. The case studies, with their sad old appearance, were of a piece with this backward-looking aesthetic. Further, in their sometimes almost parodic Freudian interpretations, they summoned a period in psychiatry that is as remote from today’s practice as the manual typewriter is from the Macintosh computer. 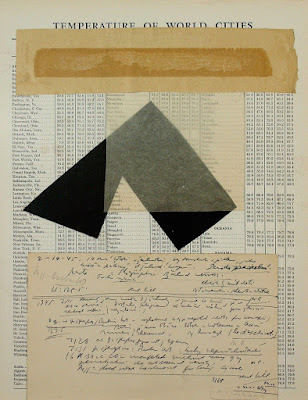 These collages arose—I’m not sure how—from this encounter with the past. ..."
The Sun with Spots Big Enough to Swallow the Earth, 2011.